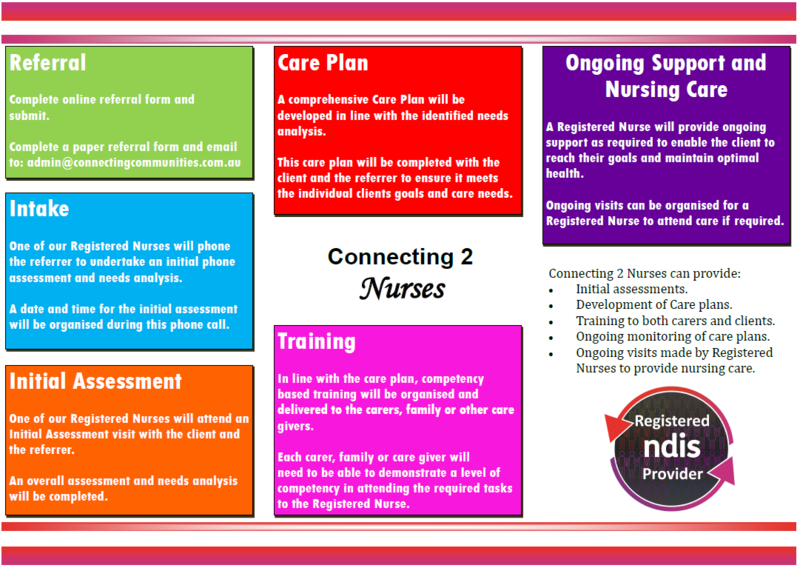 Connecting 2 Nurses (C2N) is a division of Connecting Communities, a Townsville Not for Profit community organisation. We provide a holistic nursing program for all individuals within our community including individuals who require assistance with disability support, aged care, acute and non-acute episodes of care and general nursing needs. Connecting 2 Community Circles offers Community Nursing within the Townsville and outer regions, including Charters Towers and Ayr. Connecting 2 Community Circles uses a select team of the most experienced nurses to critically assess the individual needs of each client. Working with the client, their family, carers and other personnel, our nurses can develop a tailored care plan and deliver competency-based training to ensure the level of care being provided is consistent. Connecting 2 Community Circles can provide a brokerage service that assists aged care providers and disability services to deliver exceptional in-home support services. Our brokerage service model is consistent with National Disability Insurance Scheme (NDIS) and we offer consistency in pricing, with no hidden costs.